A learning organization is the term given to an organization which facilitates the learning of its employees so that the organization can continuously transforms itself. Learning organization develops as a result of the pressures which are being faced by the organizations these days for enabling them to remain competitive in the present day business environment. The learning organization concept was coined through the work and research of Peter Senge and his colleagues. The learning organization encourages to a more interconnected way of thinking. Such organization becomes more like a community for which employees feel a commitment to. Employees work harder for the organization since they are committed to it. The concept of the learning organization is commonly hailed as panacea for organizational success in a dynamic global economy. The concept of learning organization is increasingly relevant given the increasing complexity and uncertainty of the organizational environment. In the words of Senge: “The rate at which organizations learn may become the only sustainable source of competitive advantage”. People have found the idea of a learning organization to be inspiring, yet difficult to implement. It frequently involves deep change in the mind sets of employees as well as the culture of the organization and the society. Such change does not occur overnight. The following are some of the available definitions of the learning organization. Peter Senge has defined the learning organization as the organization “in which you cannot not learn because learning is so insinuated into the fabric of life.” According to him the learning organizations are “ …organizations where people continually expand their capacity to create the results they truly desire, where new and expansive patterns of thinking are nurtured, where collective aspiration is set free, and where people are continually learning to see the whole together”. A learning organization is one that is able to change its behaviours and mind-sets as a result of experience. This may sound like an obvious statement, yet many organizations refuse to acknowledge certain truths or facts and repeat dysfunctional behaviours over and again. A learning organization is an organization that actively creates, captures, transfers, and mobilizes knowledge to enable it to adapt to a changing environment. An organization needs to learn to survive and prosper in changing and uncertain environment. It needs its managers to make right decisions through skill and sound judgment. Successful decision-making requires the organization to improve its capability of learning new behaviours over a period of time. This learning in the organization is a fighting process in the face of swift pace of change. In this battle managers are responsible for increasing the awareness and the ability of the organizational employees to comprehend and manage the organization and its environment. In this way they can make decisions that continuously secure the organization to reach its goals. However, most managers know how to ensure the organizational learning, but fail to understand how to make their organization a learning organization. Individuals and groups learn, and when conditions and systems are well designed. In a learning organization, their learning can be shared across the organization and incorporated into its practices, beliefs, policies, structure and culture. The role of a leader in the learning organization is that of a designer, teacher, and steward who can build shared vision and challenge prevailing mental models. He is responsible for building in which the employees are continually expanding their capabilities to shape their future — that is, leaders are responsible for learning. The learning organization aims to bring new ideas, debate issues, introduce innovative methods and offer case studies to others. Over time, the notion of “learning organization” as an idealized and apolitical ‘end-state’ rather than as a process, has increasingly gained uncritical acceptance. The key ingredient of the learning organization is in how the organization processes its managerial experiences. A learning organization learns from the experiences rather than being bound by its past experiences. In the learning organization, the ability of the organization and its managers is not measured by what it knows (that is the product of learning), but rather by how it learns — the process of learning. Management practices encourage, recognize, and reward with openness, systemic thinking, creativity, a sense of efficacy, and empathy. While all the employees have the capacity to learn, the structures in which they have to function are often not conducive to reflection and engagement. Furthermore, the employees may lack the tools and guiding ideas to make sense of the situations they face. Hence the learning organization which is always aspiring for success in its operation is to create a future that requires a fundamental shift of mind among its employees. The dimension that distinguishes a learning organization from more traditional organizations is the mastery of certain basic disciplines or ‘component technologies’. The five main characteristics (Fig 1) that Peter Senge had identified are said to be converging to innovate a learning organization. These are (i) Systems thinking, (ii) Personal mastery, (iii) Mental models, (iv) Building shared vision, and (v) Team learning. 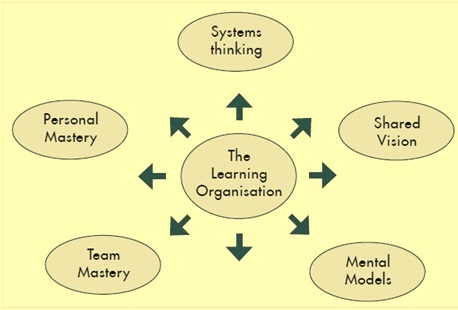 The idea of the learning organization developed from a body of work called systems thinking. This is a conceptual framework that allows people to study businesses as bounded objects. Learning organization uses this method of thinking when assessing the organization and has information systems that measure the performance of the organization as a whole and of its various components. Systems – thinking states that all the characteristics must be apparent at once in an organization for it to be a learning organization. If some of these characteristics are missing then the organization falls short of its goal. However some believes that the characteristics of a learning organization are factors that are gradually acquired, rather than developed simultaneously. Systems – thinking is the conceptual cornerstone of a learning organization. It is the discipline that integrates all the employees of the organization, fusing them into a coherent body of theory and practice. Systems thinking ability to comprehend and address the whole and to examine the interrelationship between the parts provides for both the incentive and the means to integrate various disciplines in the organization. Organizations learn only through individuals who learn. Individual learning does not guarantee organizational learning. But without it no organizational learning occurs. Personal mastery is the discipline of continually clarifying and deepening employee’s personal vision, of focusing their energies, of developing patience, and of seeing reality objectively. It goes beyond competence and skills, although it involves them. The commitment by an individual to the process of learning is known as personal mastery. There is a competitive advantage for the organization over other competiting organizations if the employees of the organization can learn more quickly. Individual learning is acquired through employee’s training, development and continuous self-improvement, however learning cannot be forced upon an individual who is not receptive to learning. Research shows that most learning in the workplace is incidental, rather than the product of formal training. Therefore it is important to develop a culture in the organization where personal mastery is practiced in daily life. A learning organization has been described as the sum of individual learning, but there must be mechanisms for individual learning to be transferred into organizational learning. People with a high level of personal mastery live in a continual learning mode. They never ‘arrive’. Sometimes, language, such as the term ‘personal mastery’ creates a misleading sense of definiteness, of black and white. But personal mastery is not something you possess. It is a process. It is a lifelong discipline. People with a high level of personal mastery are acutely aware of their ignorance, their incompetence, and their growth areas. They are always deeply self-confident. Mental models are ‘deeply ingrained assumptions, generalizations, or even pictures and images that influence how we understand the world and how we take action’. The assumptions held by individuals and organizations are called mental models. To become a learning organization, these models must be challenged. Individuals tend to espouse theories, which are what they intend to follow, and theories-in-use, which are what they actually do. Similarly, organizations tend to have ‘memories’ which preserve certain behaviours, norms and values. In creating a learning environment it is important to replace confrontational attitudes with an open culture that promotes inquiry and trust. To achieve this, the learning organization needs mechanisms for locating and assessing organizational theories of action. Unwanted values need to be discarded by the process called ‘unlearning’. The discipline of mental models starts with turning the mirror inward; learning to unearth our internal pictures of the world, to bring them to the surface and hold them rigorously to scrutiny. It also includes the ability to carry on ‘learningful’ conversations that balance inquiry and advocacy, where people expose their own thinking effectively and make that thinking open to the influence of others. If the organization is to develop a capacity to work with mental models then it is necessary for the employees to learn new skills and develop new orientations. For this there need to be institutional changes in order to foster such change. There need to have openness in the organization. It also involved seeking to distribute organizational responsibly far more widely while retaining coordination and control. The development of a shared vision is important in motivating the employees to learn, as it creates a common identity that provides focus and energy for learning. The most successful visions normally build on the individual visions of the employees at all levels of the organization. The creation of a shared vision can be hindered by traditional structures where the organizational vision is imposed from above. Therefore, a learning organization tends to have flat, decentralized organizational structure. The shared vision is often to succeed against a competitor for which there can be transitory goals. However there should also be long term goals that are intrinsic within the organization. When there is a genuine vision (as opposed to the familiar ‘vision statement’), employees excel and learn, not because they are told to, but because they want to. But many leaders have personal visions that never get translated into shared visions that galvanize the organization. What has been lacking is a discipline for translating vision into shared vision – not a ‘cookbook’ but a set of principles and guiding practices. The practice of shared vision involves the skills of unearthing shared ‘pictures of the future’ that foster genuine commitment and enrolment rather than compliance. In mastering this discipline, management is to learn the counter-productiveness of trying to dictate a vision, no matter how heartfelt it is. Visions spread because of a reinforcing process. Increased clarity, enthusiasm and commitment rub off on others in the organization. ‘As people talk, the vision grows clearer. As it gets clearer, enthusiasm for its benefits grow. There are ‘limits to growth’ in this respect, but developing the sorts of mental models can significantly improve matters. Where the organizations can transcend linear and grasp system thinking, there is the possibility of bringing vision to fruition. The accumulation of individual learning constitutes team learning. The benefit of team or shared learning is that the employees grow more quickly and the problem solving capacity of the organization is improved through better access to knowledge and expertise. A learning organization has structures that facilitate team learning with features such as boundary crossing and openness. Team learning requires individuals to engage in dialogue and discussion. Therefore team members must develop open communication, shared meaning, and shared understanding. A learning organization typically has excellent knowledge management structures, allowing creation, acquisition, dissemination, and implementation of this knowledge in the organization. Team learning is viewed as ‘the process of aligning and developing the capacities of a team to create the results its members truly desire. It builds on personal mastery and shared vision – but these are not enough. Employees need to be able to act together. When teams learn together then not only there are good results for the organization but the team members also grow more rapidly which could not have happened otherwise. The discipline of team learning starts with ‘dialogue’, the capacity of members of a team to suspend assumptions and enter into a genuine ‘thinking together’. The notion of dialogue amongst team members helps them to become open to the flow of a larger intelligence. When the dialogue is joined with systems thinking, there is the possibility of creating a language more suited for dealing with complexity, and of focusing on deep-seated structural issues and forces rather than being diverted by questions of personality and leadership style. A learning organization does not rely on passive or ad hoc process in the hope that organizational learning will take place through serendipity or as a by-product of normal work. A learning organization actively promotes, facilitates, and rewards collective learning. The main benefits of a learning organization are as follows.